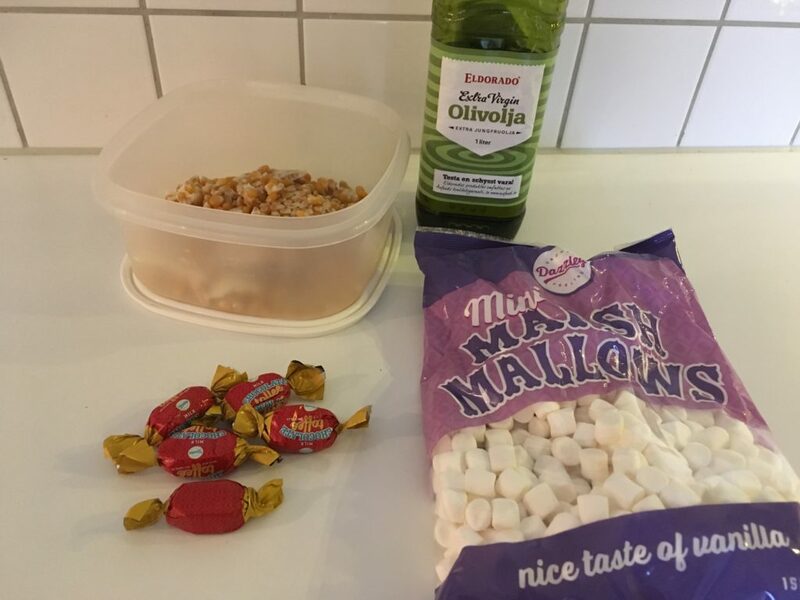 We love our campfires, but during the winter when it is freezing temperatures and snow, it is even more important to keep our morale boosting treats simple. So, with this in mind we decided to try campfire popcorn for the first time. The great thing about this treat is you can be a little creative with it. Do whatever your taste buds fancy….read on and find out how. Oil to cook them in. Anything else you fancy using to flavour them with. On this occasion we tried chocolate covered toffees and marshmallows. They would melt to coat the kernels whilst they were popping. But you can try anything you fancy…salt, chilli, plain toffees etc. The only limits to flavouring your campfire popcorn is your imagination or taste buds! Add some oil to the bottom of a pan. You can choose whatever pan you fancy as long as it has a lid. 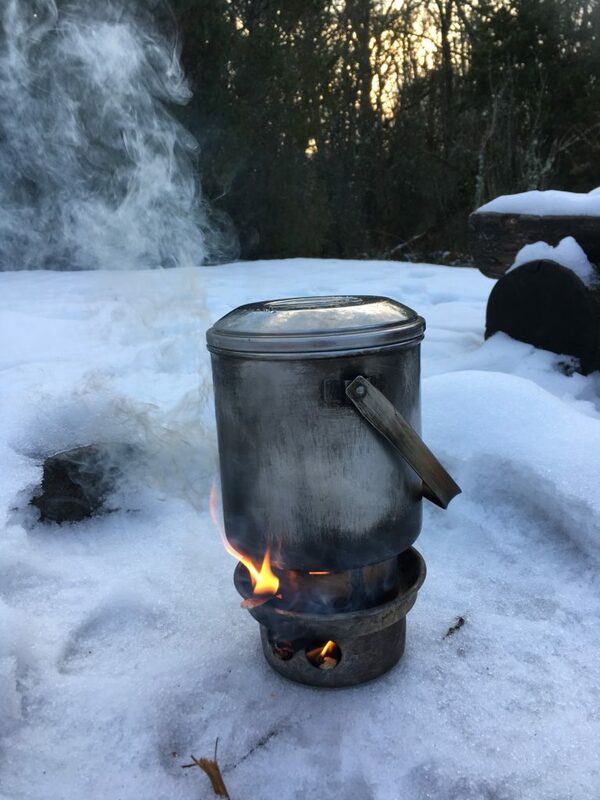 This just happens to be the shape of our campfire pot and it worked fine. Layer some kernels at the bottom. You only want to keep them one or two layers deep. This is because otherwise you will be left with a lot of “unpopped” kernels. So you are better using a larger shallower pan, than a deeper narrower pot like us. But we just made a few batches. 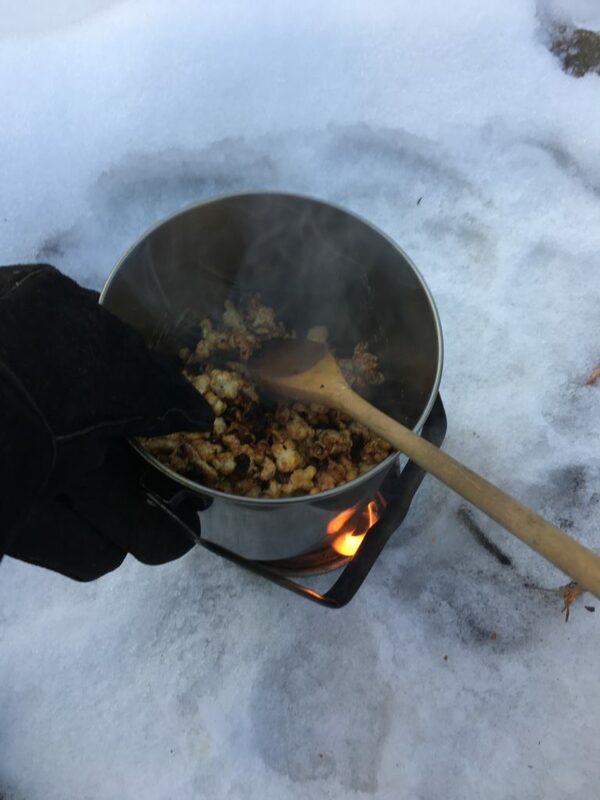 Pop in whatever else you are flavouring the campfire popcorn with, and then make sure then pan is covered so the kernels do not jump out when they pop. This cooks very fast, in a matter of minutes, so keep an eye, or else your lower kernels with just be cremated. We had a few charred popcorn lumps in amongst our batches of campfire popcorn, but otherwise it was a huge success. It smelt great whilst it was cooking, it was fast to cook, and best of all tasted warm and delicious. Mmmmmmmmm. 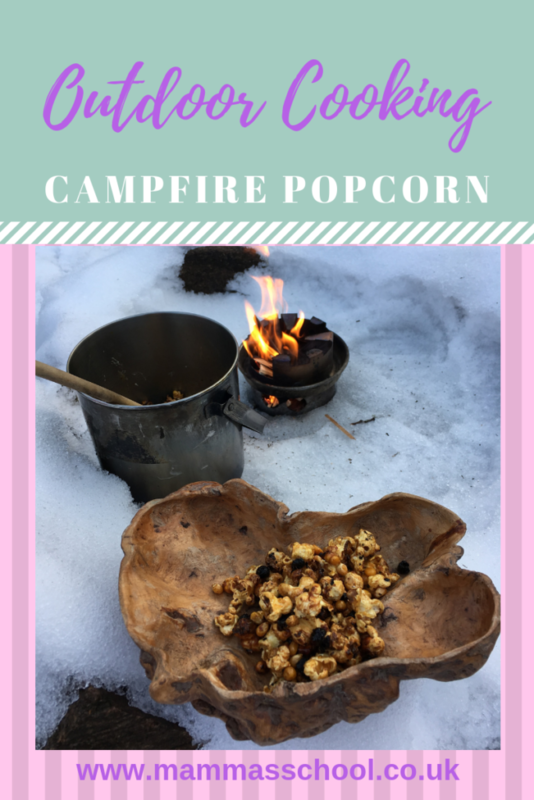 I love being creative with my popcorns but never done it outdoors before, this looks absolutely yummy. Oh my word this looks amazing! Going to have to give this a go I think when the nights start turning a bit warmer! 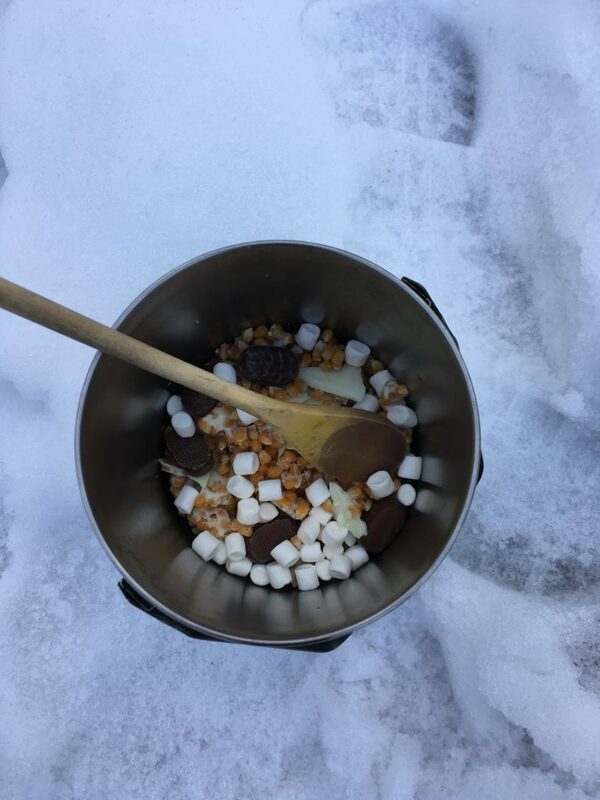 That does sound like the ultimate campfire treat especially with the marshmallows and toffee at play – yum! It was so yummy with those added in! Ooh, I love anything popcorn related! I’ll have to bookmark this for if we ever have a campfire. Oh wow I’ve never heard of this but it sounds yummy!! You have the most fabulous ideas when it comes to campfire treats. 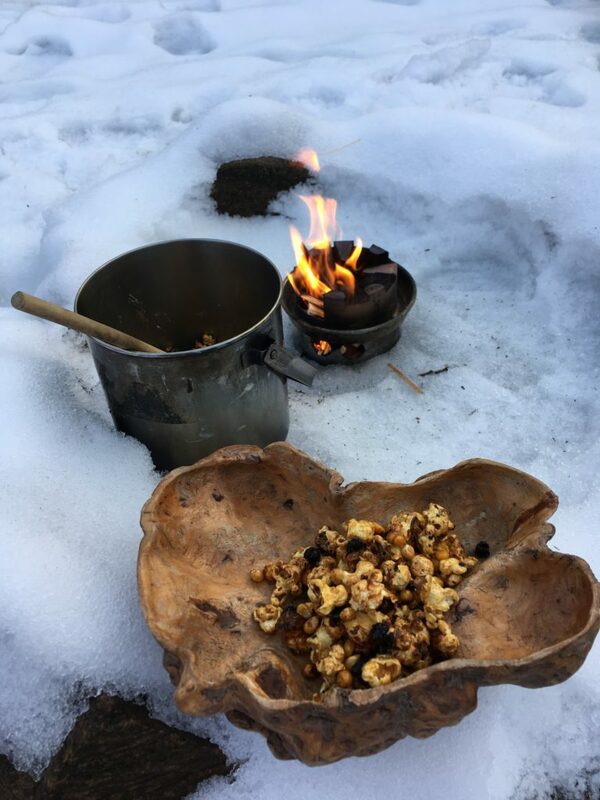 I would not have thought of doing popcorn on the campfire, it sounds delicious. Ah thank you! I wish I had thought of it sooner as it was so easy! You will have to let me know if you try it!